Working for Disney is one the most magical occupations out there. Surely, you’ve seen the signs around campus or you’ve had this on the calendar for months. 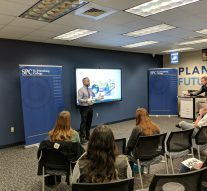 On January 30, from noon to 2pm, an informational meeting was held in the career hub at the Tarpon Springs campus. This meeting discussed the specifics of a premier internship and college program opportunity at the Walt Disney Orlando Resort. Below is a summary of the key points that were covered. 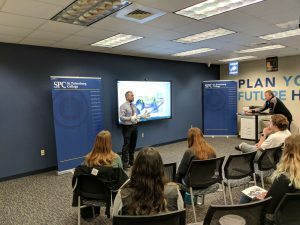 The meeting explained two different experiences college students could apply for: the Disney College Program and the professional internship. The Disney College Program (DCP) is an opportunity to work for Disney at an entry-level position to learn the inner workings of one the world’s most visited tourist attractions. This is the opportunity that was discussed the most at the meeting. Some roles they offer in the DCP include working at various rides, custodial work, valet, greeter, and more. It is a perfect opportunity to learn how to attain a career at Disney and how to climb the ladder. In fact, both the President of WDW Orlando and the VP of Hollywood Studios attended this program. This gateway to a Disney career does not require a résumé and is about one semester long. Furthermore, the DCP is highly recommended if an applicant wishes to one day apply for the professional internship. The professional internship is a much more competitive opportunity when compared to the DCP. The internship covers a career path of one’s choosing, which includes but is not limited to veterinary care, graphic design, managerial/business majors, and many more. To improve the chances for a student to get accepted, they should possess numerous items on their résumé that pertain to the nature of the internship. Located at a nearby apartment complex in Lake Buena Vista, students in the DCP enjoy a dorm-like housing atmosphere: you share your room with up to 5 other roommates, there is a visitor restriction after 1am, and there are counselors and security on-site. As you can imagine, working at Disney provides some exciting benefits. Members of the Disney College Program are granted free access to all five parks, discounted food and souvenirs, exclusive peeks at new attractions, and weekly pay to name a few. One important aspect of working the front lines of Disney is the appearance. All employees, or “cast members,” must satisfy the requirements of “The Disney Look.” This includes covering tattoos at all times and natural hair color, among other regulations. 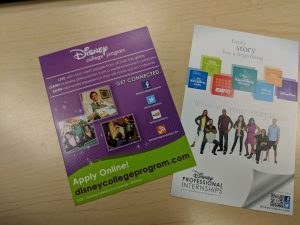 The Disney College Program is a paid internship, but the applicant must pay some upfront fees. The fee to enroll in the program is $225, and the initial fee for housing is $130. Following these fees, the rent for your housing comes out of your weekly paycheck. To earn that paycheck, a student works a 40-hour work week, making anywhere from $10-$12.31 per hour. To be a part of the Disney College Program, a student must dedicate a lot of time to the program. The program lasts 4-7 months and students work Monday through Friday. Additionally, if a student wishes to continue his or her education while they are at Disney, they can take online courses during their internship. 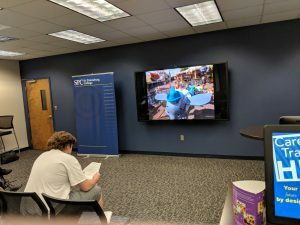 Disney also offers courses of their own, which provide a look into “How Disney does it,” according to one of the presenters at the meeting. These courses are not college accredited but provide crucial knowledge for students who wish to pursue a career at Disney. The meeting ended with a brief questions and answers period and then aspiring cast members were on their way. If you or someone you know is interested, the applications for both the Disney College Program and the professional internship are live.